ORLANDO, Fla. — Wellness programs provider Rolling Strong announced a new mobile app that enables commercial drivers to focus on making healthy lifestyle choices on the road. Truck drivers are twice as likely to be obese as the general population and about twice as likely to have diabetes. “Certainly, we see a lot more elevated blood pressure in the men and women out there driving trucks. Smoking is more than double for drivers. Plus, they are not getting a lot of exercise out there,” Kane said. 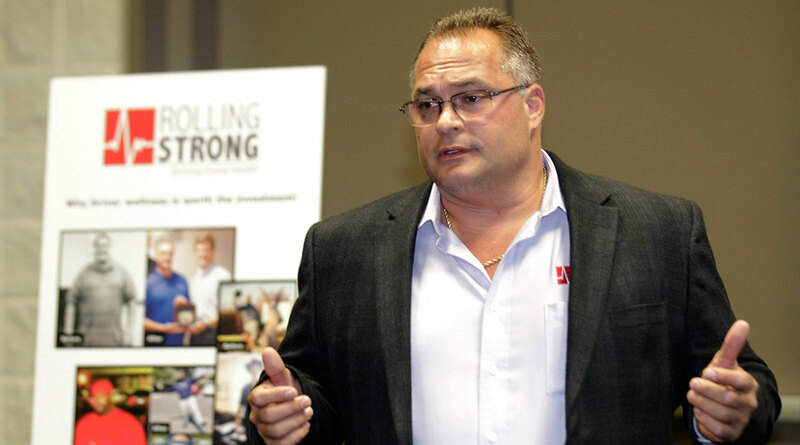 Rolling Strong’s legacy product has about 10,000 users, he said. The company made the announcement Oct. 21 during a press conference at American Trucking Associations’ Management Conference & Exhibition. The new Rolling Strong health and wellness mobile app for IOS and Android devices offers nutritional guidance with meal suggestions and predictive nutrition based on location, truck stop, restaurant and food item search capabilities, as well as daily food logging with calorie counts and targets. Also, the new app comes with exercise programs with guided workout routines designed to be done anywhere without the need for a gym, based on personalized preferences with duration and intensity choices, and daily step tracking with an integrated wearable activity tracker. There is also sleep time and pattern tracking with an integrated wearable activity tracker, and integration with continuous positive airway pressure machines, called CPAPs. The app holds personal health records, including biometric data from physicians, wellness coaches or health check stations. The app issues DOT certification reminders when medical evaluations are due and when medical certificates need to be renewed. And the app provides the ability to connect with a wellness coach. To help encourage drivers to use the new Rolling Strong mobile app they can also earn points for logging sleep, exercising and meeting daily calorie goals. Fleets can use the app to create and manage interactive competitions. Points earned by drivers can be redeemed at a growing network of partners, such as truck stop operators — including TA, a unit of TravelCenters of America. The new app can be licensed by fleets as a monthly subscription, or individual drivers can sign up for it, Kane said. “The new app is just the beginning of where we are going with things. Our intention is to build it into an ecosystem with companies so we really manage their wellness programs for them,” Kane said.